This page does not represent an official position of the Lycée Classique de Diekirch or the Ministry of Education on climate change and global warming. The official position of the Ministry of Environment of Luxembourg can be found here. If you do not want to read the following links and discussions, please go back! Working for clean air and an unpolluted atmosphere is a laudable aim, but forgetting to compare the magnitude of man-made pollutants to the natural sources, or having an absolute faith in measurement data of often dubious origine, is unscientific at least, and foolish certainly. The climate is "the changing state of the atmosphere", so do not expect a steady state situation. Do not forget either that the sun is the engine which drives everything, and that the output of that engine is in constant change! The newest additions to this link list are on top! next page (starting 2009) Hockey-Stick discussions Quotes ! Oceanic influences on recent continental warming Important paper by Compo et al.:. "The recent worldwide land warming has occurred largely in response to a worldwide warming of the oceans rather than as a direct response to increasing greenhouse gases". WCR comment here . Time to ditch Kyoto, the sequel Read this extremely clear article of Prof. Prins; also this WCR comment here , an article by F. Massen here and an editorial by D. Lawson here..
Wer sich irrt, soll zahlen! Interview of Prof. Reichholf by Bild der Wissenschaft (in German). The Overhyping of Green By Prof. W. Gray: "Reducing atmospheric CO2 will not by itself solve any of the globe’s many environmental problems"
Kyoto is worthless.. ..and you don't have to be a sceptic to believe that now!. Scathing article by Dominic Lawson. Antarctic ozone hole caused by cosmic rays? Read here and here. Temperature above the equator Read the comment by Prof. O. Humlum (www.climate4you.com) on the missing AGW fingerprint! IEA World Energy Outlook 2008 Executive summary. A mathematical analysis of the divergence problem in dendroclimatology A new paper by C. Loehle on the divergence problem: tree ring temperature reconstructions give uncorrect (too low) recent temperatures. See shorter discussion here. Limits on CO2 Climate Forcing from Recent Temperature Data of Earth A new very easy to read paper by Douglass and Christy on limits for CO2 climate forcing: "Trend expected from CO2 =0.07K/decade which contradicts the IPPC AR4 statement that most of the observed increase in global average temperature since the mid-20th century is very likely due to the observed increase in anthropogenic greenhouse gas concentrations" as trend without CO2 is 0.062K/decade. Sun warms and cools the earth A comment by Prof. Jaworowski: "Polar ice does not fulfill the close-system criteria, essential for reconstruction of chemical composition of the ancient atmosphere." Global warming: why cut one 3,000th of a degree? Comment by Björn Lomborg in Timesonline. Eher wolkig als heiter A comment from Prof. Lüdecke. (in German): "In der CO2-Kampagne wird überdies oft zu irrationalen Methoden gegriffen, um die erwünschten Meinungen zu produzieren"
Acceleration of Jakobshavn Isbræ triggered by warm subsurface ocean waters A new study on Greenland glacier movement by Holland et al. : acceleration is caused by changes in the atmospheric circulation in the North Atlantic region (not AGW?). A Pragmatic Energy Policy for the UK A bomb-shell report in the renewable's garden? Prof. Ian Fells warns that Britain will face electricity shortages; 20-30% generating power will be missing in the next decade due to government inaction. US and Caribbean tropical cyclone activity related to the solar cycle Are solar activity and hurricane counts related? Elsner and Jagger say yes. Link to abstract of GRL paper (Paul Bigg's discussion here and Chris Landsea's comment here). On the Credibility of Climate Predictions Important paper by Koutsoyiannis et al: "At the annual and the climatic (30-year) scales, GCM interpolated series are irrelevant to reality." A comment on www.realclimate.org A caustic comment by Jim Peden, at switchboard.nrdc.org (search page for Peden). "There is great evil in the Global Warming Hoax. Jim Hansen and Al Gore are not inherently evil persons, but what they have done to spread worldwide panic and a hysterical rush to find a cure for what I and my 32,000 science brethren consider a nonexistent disease, is potentially the greatest calamity in the history of mankind which will lead to starvation for millions, if not billions of people on our planet." Anthropogener Meeres-Anstieg: vom Konstrukt zut Panik Article (in German) by meteorologist K.E. Puls. Very clear! Policy Consequences of the Narrow View of the IPCC Very good comments by Roger Pielke Sr. on his blog: "The focus on carbon dioxide emissions as the dominate human climate forcing is resulting in the misleading of policymakers." Many other links. Climate prediction from tree rings Poster from Finnish research with prediction for future temperatures, based on their analysis of tree rings. No pending thermal catastrophe! Graph and WCR comment. Do tree leaves have a thermostat? 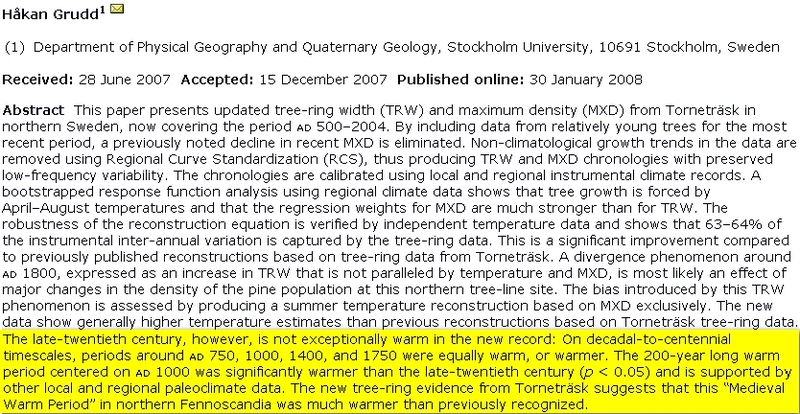 Have all tree ring paleo-climate records got it wrong, and is this the final nail into the hockey-stick coffin? Read also here! Who killed cap and trade? Article by M. Schellenberger: "..environmental groups and Democratic lawmakers might have considered an alternative approach, one focused on making clean energy cheap rather than making dirty energy expensive". Read also here. Soot not CO2 melts Arctic ice! Read this article.from Scientific American. The Copenhagen Consensus Forget climate change, we should spend on nutrition! Also here! Economics, Politics and Climate Change: Are the Sceptics Right? Julian Hodge Bank Lecture by Prof. Colin Robinson, Apr. 2008. "Direct promotion by governments of particular ways of `solving’ the perceived problems is unlikely to succeed and is only too likely to have unfortunate side-effects, including constraints on individual freedom"
Very good article of R. Innis in The Washington Times on energy policies. The Devil is in the Generalities Excellent article by Prof. McKitrick, of the hockeystick killer-team. Abstract of paper by N. Keenlyside et al. in Nature. No Global Warming for the next 10 years! Did the IPCC forecast this? NO!. Read also this paper on the Atlantic meridional overturning circulation (MOC) variability. Weltwoche article here. And chuckle with L. Motl ! Reconstruction of past decades sea level using thermosteric sea level, tide gauge, satellite altimetry and ocean reanalysis data Is the sea level rise accelerating ? No say Berge-Nguyen in this paper (ScienceDirect abstract). Look also here and here. The apocalypse is the scientist’s fundamentalism Lord Robert Skidelsky: "Scientists are notoriously loath to jettison conclusions reached by approved scientific methods, however faulty. But their intolerance of dissent is hugely magnified when they see themselves as captains in a salvationist army dedicated to purging the world of evil habits." 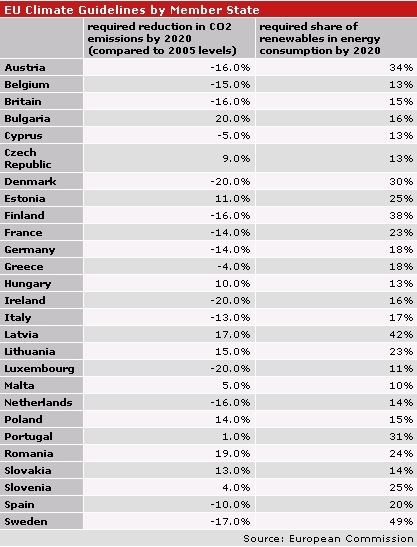 Air pollution by ozone through Europe in Summer 2007 At last, a ray of hope: "Ozone levels during the summer of 2007 were among the lowest in the past decade" says this EEA report. But: "... the directive's long-term objective to protect human health (maximum c(O3) of 120 μg/m3 over 8 hours) was extensively exceeded in the EU and other European countries. " Not a surprise here: set your maxima impossibly low, and you will be sure to surpass them every year (and have a good argument for more research money!). See meteoLCD trends! The Sloppy Science of Global Warming By Dr. Roy Spencer, in Energy Tribune. The Civil Society Report on Climate Change Contains a remarkable chapter by Paul Reiter (Institut Pasteur): Human Ecology and Human Behavior: Climate change and health in perspective. Big and well written report. Read this very clear article by Lord Nigel Lawson (Daily Mirror, 06Apr08). Also this comment by Christopher Booker in UK's Telegraph. This is an eye-opener (2008) from the Joint Research Centre of the European Commission: "It is obvious that the cost disadvantage of biofuels is so great with respect to conventional fuels (at least in the mix foreseen in the scenarios analysed), that even in the best of cases, they exceed the value of the external benefits that can be achieved." Climate change and health Read article "More Global Warming Nonsense" by Paul Reiter. And to illustrate the opposite, read this article in the Luxemburger Wort containing (besides some evident truth) all the GW clichés we are used too. Climate Change, Natural or Man-Made? Article by author Malcom Heymer; many references. Aerosol radiative forcing and climate sensitivity deduced from the Last Glacial Maximum to Holocene transition New AGU paper by Chylek et al on climate sensitivity: historic value was 0.49 W/m2. See also here! The greenhouse effect A blockbuster very theoretical paper by Ferenc Miskolczi on greenhouse radiative equations. "...the increased atmospheric greenhouse gas concentrations must not be the reason of global warming...". Read also this more palatable article . Potential in climate controversy Dr. Joanne Simpson (formerly of the NASA Goddard Space Flight Center) writes at Climaze Science blog: "Since I am no longer affiliated with any organization nor receive any funding, I can speak quite frankly"
Freeman Dyson speaking on GW and CO2 Video! Climate of belief Extremely clear article by Dr. Pat Frank explaining the uncertainties of climate models and the folly to predict 2100 global temperatures using actual GCM's. Sun changes will bring cooling soon Sun changes will bring cooling soon say Science and Space Research Center and Nasa. Should we expect a Dalton minimum #2 ? Planned EU "climate" guidelines Suicidal madness or realistic targets? : read Prof. Stott's critique here and an interview with president V. Klaus. Witanagemot Justice Roger Pielke Jr. from the University of Colorado (Prometheus blog) on the "attack dog climate scientists"
Weather, climate and noise Excellent discussion by Lubos Motl on a subject raised by realclimate. La Grande Illusion: courant vert et bleu A non-scientific article by F. Massen in Luxembourg's national newspaper Luxemburger Wort (17Jan08) on "green" and "ordinary" electricity. 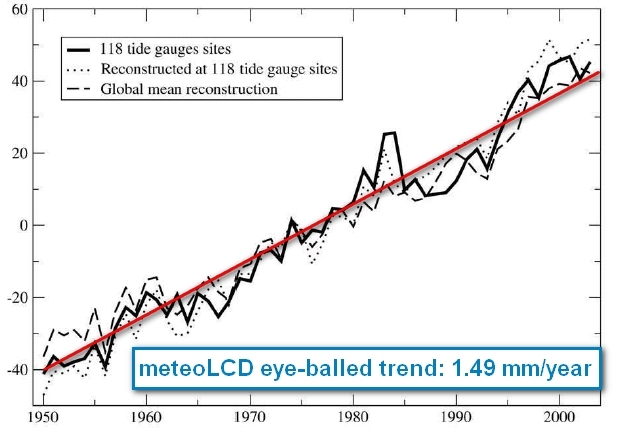 In French, pdf..
Decadal Trends in Sea Level Patterns: 1993–2004 Prof. Carl Wunsch (MIT) et al. : best estimate of trend of sea level rise is 1.6 mm/year. No acceleration, no Rahmstorfian surge! (2007, AMS). "At best, the determination and attribution of global-mean sea level change lies at the very edge of knowledge and technology"
Don't fight, adapt! An "Open Letter to the Secretary-General of the United Nations" (with list of 100 signatures) (13Dec07); there is no consensus on AGW ! " In stark contrast to the often repeated assertion that the science of climate change is "settled," significant new peer-reviewed research has cast even more doubt on the hypothesis of dangerous human-caused global warming." Summary of 2007 Atlantic Tropical Cyclone Activity by Klotzbach & Gray. "Although global surface temperatures have increased over the last century and over the last 30 years, there is no reliable data available to indicate increased hurricane frequency or intensity in any of the globe’s seven tropical cyclone basins besides the Atlantic"
Shortwave Forcing of Earth's Climate A new (2007) important paper by Goode & Pallé on modern and historical variations in the Sun’s irradiance and the Earth’s reflectance: " the Earth’s large scale reflectance... is a much more variable climate parameter than previously thought" " The decrease in the Earth’s reflectance from 1984 to 2000 ... translates into a Bond albedo decrease of 0.02 (out of the nominal value of about 0.30) or an additional global shortwave forcing of 6.8W/m2... IPCC, 2001 argues for a 2.4W/m2 increase in CO2 longwave forcing since 1850". Politics posing as Science A critical discussion of IPCC's AR4-SPM. Click here for the originals: SPM and full report. Geocentric sea-level trend estimates from GPS analyses at relevant tide gauges world-wide Important new paper by Wöppelmann et al. on precise sea-level measurements, using GPS data to correct the tide-gauges record for land movements. Sea-level rise is 1.31 mm/year (not 1.8 mm/year) for the last 100 years. Climate Science Prof. Roger Pielke's famous Climate Science website is back. Look here for a different view from the consensus crowd! This site does not parrot, but thinks! Climate Change 2007: Synthesis Report Link to the Summary for Policymakers. Full report here. Arctic Ocean Circulation Does an About-Face A report from NASA scientists: "The results ( of this study) suggest not all the large changes seen in Arctic climate in recent years are a result of long-term trends associated with global warming." Abstract here. Northern hemisphere tropical cyclone activity at a historic low! And read here how badly wrong was NOAA's prediction for 2007! Help we are cooling! See Al Gore's AIT original graph! (read here too). Were Al's referees shortsighted? European Storminess: late nineteenth century to present New paper by Matulla, von Storch et al: storminess did not continuously increase: "Most recent years are characterized by a return to average or calm conditions"
Emissions Reductions may be risky Paper by A. Carlin for the EPA: "emissions reductions alone do not appear to be an effective and efficient single strategy for climate change control" (June 2007, NCEE paper). Original link here. The Greenland-Antarctica melting problem does not exist Comment by Prof. Cliff Collier (The University of Western Australia): Hansen's models are flawed! Words from Freeman Dyson From the autobiography of this great British-American physicist. Show AIT only with warnings in schools! 11 inaccuracies in Al Gore's AIT must be mentioned, rules a UK judge. Confidence, uncertainty and decision-support relevance in climate predictions Very interesting paper by Stainforth et al. on climate models uncertainties (June 2007). Read here the comments of Lubos Motl on the related paper by Roe and Marcia Baker "Why is climate sensitivity so unpredictable"
Global Warming Delusions Read this clear article by emeritus Prof. Botkin from UCSB (WSJ, 17 October 07): "...the popular imagination today appears to have been captured by beliefs that have little scientific basis"
The Myth of Dangerous Human-Caused Climate Change Well written paper (May 2007) of Prof. Bob Carter, James Cook University. Cites meteo.lcd.lu. Clues to End of the Last Ice Age Prof. Lowell Stott at USC News: "carbon dioxide did not cause the end of the last ice age"
Nasa news on arctic winter ice loss Nghiem: "...the rapid decline in winter perennial ice the past two years was caused by unusual winds". See also here and here for the paper. Debunking sea-level rise scare An hysteria loaden AP article on sea-level rise is debunked by proeminent scientists. Environmental Effects of Increased Atmospheric Carbon Dioxide Robinson et al paper: "increases during the 20th and early 21st centuries have produced no deleterious effects upon Earth’s weather and climate". Read this paper that debunks most Al Gore's myths! Reply to Lockwood et al paper A reply by Svensmark & Friis-Christensen from the Danish Space Center to the paper of Lockwood & Fröhlich "The persistent role of the Sun in climate forcing": Contrary to the argument of Lockwood and Fröhlich, the Sun still appears to be the main forcing agent in global climate change. Solar Wind Warming Up Earth Read this article by Yuri Zaitsev in Novosti, 28 Sep 07. "The increase in the fraction of intense tropical cyclones in recent decades results primarily from a shift in this scaling transition toward weaker winds rather than an increase in the maximum potential intensity directly attributable to rising sea surface temperatures" (GRL paper by Swanson; link to draft). Read also here! Direct and indirect metabolic CO2 release by humanity 251 g carbon per day per individuum --> it's > 3Gt carbon per year for the whole world, domesticated animals included, say Prairie et al., with a spectacular rise since 1850; and all this ignored by the IPCC! Read also the CO2 Science discussion of this paper here. Please save the world and stop breathing (or at least ask your dogs & cats to do it!). Global Warming: Forecasts by Scientists versus Scientific Forecasts Read this paper (draft) of Prof. Scott Armstrong from Pennsylvania University. Regarding the IPCC 4AR: "...the forecasts in the Report were not the outcome of scientific procedures. In effect, they were the opinions of scientists transformed by mathematics and obscured by complex writing"
Arctic ocean getting warm; seals vanish and icebergs melt ...Great masses of ice have now been replaced by moraines of earth and stones, ...at many points well-known glaciers have entirely disappeared...The Washington Post, Nov 2nd, 1922(!) (see here). Heat Capacity, Time Constant, and Sensitivity of Earth's Climate System Climate sensitivity is only 1.1°C ! (IPCC says 3°C). Read the full Schwartz paper and also his Nature Report here!. How much more rain will global warming bring? Precipitation and wind-speed: climate models get it completely wrong! Read CO2Science discussion of Wentz et al. (Science, 2007) paper. Global Warming and hurricanes (2007) Read the latest papers by Landsea, Holland and Chang on this subject! Climate Stability, an inconvenient proof New paper by Bellamy et al (link to abstract, full text is 30$): "doubling of CO2 will amount to less than 1°C global warming"
Planet against the Grain Excellent presentation of J. Foley on Land Cover/Land Use Change impacts. "Agriculture is a major planetary force...Current focus on CO2/climate connection is very short sighted.."
The Great Global Warming Swindle (interview) The controversial film by Martin Durkheim continues to make waves and splashes. This is an interview by Tony Jones (Australia) with Durkheim. See here for the film and also here for the upcoming DVD. Trends in solar climate forcings Interesting and very readable paper of Lockwood et al., concluding that the trend in various solar parameters since 1985 can not explain the rise in global air temperature. This paper will not be the last word on this important subject: see here! The Global Warming Myth Prof. David Bellamy on the NZ Climate Science Coalition: "Why scare the families of the world with tales that polar bears are heading for extinction when there is good evidence that there are now twice as many of these iconic animals"
Linkages between solar activity, climate predictability and water resource development Interesting paper by Alexander et al. (South-Africa) on the linkages between solar activity, climate predictability and water resource development. 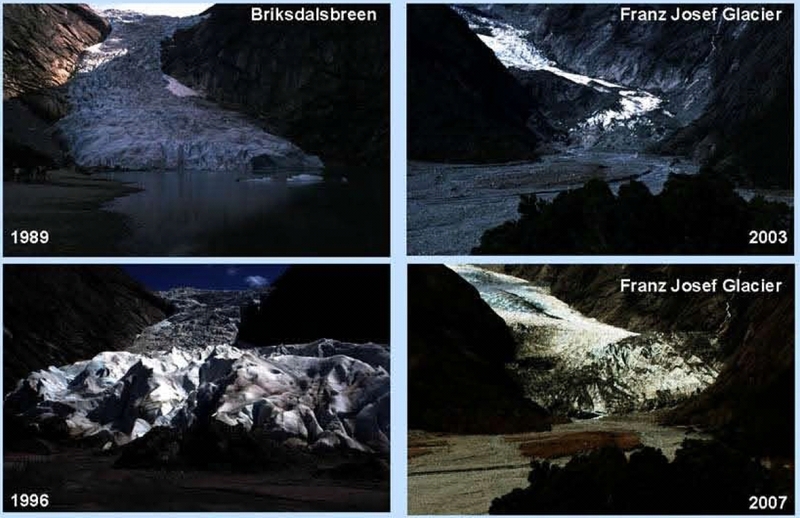 Very high-level Mont-Blanc glaciated areas not effected by the 20th Century climate change Mont-Blanc glaciers not shrinking! New Vincent et al paper: "The most striking features of these figures are the small thickness changes observed over the 20th century". Abstract only here . Climate Mythology A presentation of Richard Seager at Columbia University ( 7Jun07) on the panic of a Gulfstream slowdown. Full text here. Development of a parametrization for simulation the urban temperature hazard... New paper by Menglin et al. on the urban heat effect. "Although a single urban region may not result in a large impact on global climate, the collective impact of all urban regions on the global climate system is as yet unknown and unstudied"
ABC of Greenhouse Effect Very readable article by Lubos Motl from Harvard University. Most of global warming is past history! Read also Realclimate's explanations here and here! Kilimanjaro glacier melt Yet another AGW and Al Gore icon collapses: Kilimanjaro glacier melt not due to global warming. Also here. A must-read article by Kevin Trenberth (IPCC author) on the shortcomings of GCM and the importance of regional climate studies; IPCC scenarios are not predictions, just projections! (Climate Feedback blog, Nature). This intelligent paper is a far way off the usual "Al Gore'ism". The Dirty Snow Much of Arctic's current warming could be caused by black carbon (BC) deposits (New-York Times article, reading needs free registration). GRL abstract here. Is the sky really falling? 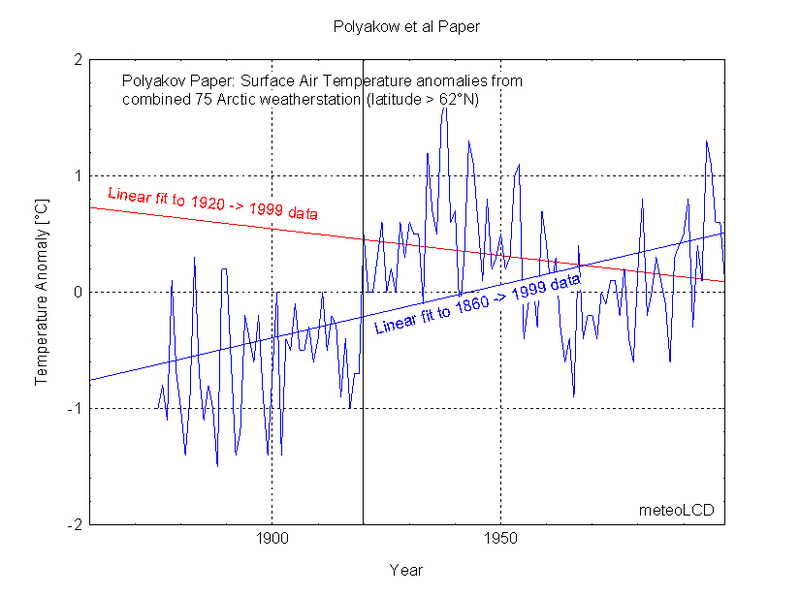 Pat Michaels writes on the flood of global warming papers. The Nature of Arguments for AGW By Richard Lindzen. 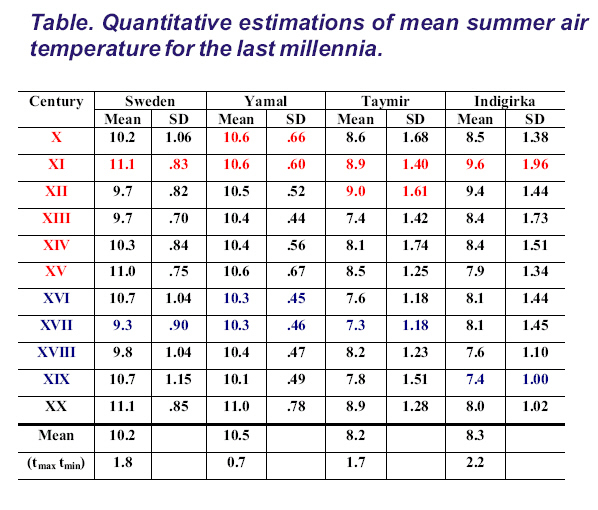 2003 European heat wave unusual? Chase et al. say that "...no strong support that regional heat or cold waves are increasing..."
Ich hoffe, das hört bald auf Read this crystal-clear interview with R. Lindzen in the Weltwoche (in German). Sea water emissivity, a neglected climate forcing Sante Fe 2006 presentation of Dr. Hartwig Volz from RWE on an important climate forcing factor, stubbornly ignored by the IPPC consensus. Good and clear! Does a Global Temperature exist? Very interesting paper by Essex/McKitrick, lots of healthy maths! Read a more easy-going text here. Scientific Errors with the IPCC SPM (Feb07) Read this artucle of Prof. Roger Pielke in "SCitizen"
End the Chill Lawrence Solomon of the Urban Renaissance Institute on global warming "deniers"
Multi-scale analysis of temperature change Zhen-Shan et al. on coming cooling! Gloom and Doom Comment by F. Massen on 4AR SPM to Luxembourg's top national news paper (in German) with a reply from researcher G. Kneip of the CRTE culminating in a call for censor-ship! IPPC 4AR Summary for Policy Makers original 02Feb07 version with errors here , new 05Feb07 version here. Interstellar-Terrestrial Relations Big (139 pages) and interesting paper by Scherer et al. on interstellar terrestrial relations; read here some sentences from coauthor Jan Veizer (Hebrew University) on climate and galactic cosmic rays. Life's too short to be carbon neutral (spo1) & The sin of flying (spo2) on spiked online! Richard Lindzen on CNN (excerpt) "...and I think future generations are not going to blame us for anything except for being silly, for letting a few tenths of a degree panic us"
Poster on global sea-level change during the 20th century By Simon Holgate, Proudman Oceanographic Laboratory, Liverpool; quite different from ICCP's 4AR SPM! A personal call for modesty, integrity and balance An extremely well written article by Dutch Prof. Henk Tennekes; from Prof. Roger Pielke's weblog. Richard Lindzen on CNN Larry King Late Night Excerpt with two statements by Prof. Richard Lindzen, MIT. Full transcript here! Political Interference in Science: Global Warming This is the Roger Pielke Jr. testimony (extended version) of 30Jan07 to the Committe on Government Reform (US House of Representatives). Clear, intelligent, good. The Stern Review: a Dual Critique A MUST READ 2 part article by Carter, Lindzen, de Freitas and al. on the Stern Review. (World Economics Journal, Vol.7/4. Oct-Dec06). twentieth century Very important paper on sealevel change: it was noticeable higher during the first than the last part of the 20th century. Sealevel was constant or even falling during the last 10 years!. Look here for a poster of the results. La France doit rester en tête de la lutte contre le réchauffement climatique Article (in French) published in Le Figaro (26Dec06) by 3 French nobelists; the remarkable point is the insistance on the necessity to use nuclear energy (of which France is world champion). New Ideas in Science Read this wonderful year 1989 article of the late Dr. Gold on science herd instinct, referee and funding problems; Dr. Gold is the father of the heretic "deep hot biosphere" thesis, which has been recently confirmed in a spectacular manner by the findings of nano-microbes in disused mine waters. Everything he writes rings true also for current climatology! Laying Ten Global Warming Myths Prof. Bob Carter from the James Cook University, Australia. Hot and Cold Media Spin Cycle US Senator Inhofe released a booklet on media climate alarmism. Even if you don't follow Inhofe at 100%, this booklet contains a gold mine of useful links. Chaotic world of climate truth Mike Hulme, director of the Tyndall Centre for Climate Change Research, on climate catastrophism. The Morality of Climate Change Good comment by Prof Carter on Al Gore's moral hammerings... original (and many other good articles) at Prof. Carter's web site here. Read also this (02 Oct 2007). Are Humans involved in Global Warming? A paper by Khilyuk and Chilingar in Environmental Geology raises fundamental questions: "Humans may be responsible for less than 0.01°C (of approximately 0.56°C (1°F) total average atmospheric heating during the last century". The link is to a discussion on the World Climate Report web site. Larsen & Clark report in the journal of Coastal research that there is no connection between CO2 and sea-level rise. SW Greenland temperature data New important paper by Vinther et al: Greenland warmest decades were 1930/40; 1990/2000 decades colder than any previous 6 cold decades! Read comment here . Apocalypse Cancelled and Gore Gored Read these articles by Christopher Monckton (Viscount Monckton of Brenchley) published in Sunday Telegraph; the first is a sober comment on the climat scare fashion, the second an answer to Al Gore. The Stern Review 1. The much pre-hyped Stern review has been published; read comments by Prof. R. Tol ("the Stern review can be dismissed as alarmist and incompetent"), B. Lomborg , P. Stott , G. Reisman, Newsweek. Fire and Ice Read this Business and Media special report on media coverage of future climate. Getting closer to the cosmic connection to climate H. Svensmark from the Danish National Space Center has shown in the SKY experiment that cosmic galactic rays modulated by the sun's activity are a BIG player in the global warming debate! Global temperature change Read this new (25Sep2006) scary PNAS paper by James Hansen et al... don't take it for the last word! A complete list of all things caused by Global Warming Very funny updated list on papers and research: there is nothing NOT caused by AGW ! Le réchauffement climatique est un mythe Interview (in French) with exremely sceptical Prof. Marcel Leroux (Université Lyon 3); published 2004. Last stand of our wild polar bears Dr. Taylor, a Canadian polar bear biologist: the Arctic bear populations are fine and not declining! Russian scientist predicts global cooling starting soon! Khabibullo Abdusamatov: a period of global cooling similar to one seen in the late 17th could start in 2012-2015 and reach its peak in 2055-2060. Read also the 1975(!) Newsweek article on impending global cooling! Greenland Climate change Abstract of paper by P. Chylek at the Sante Fe conference (July 2006) on GW and Next Ice Age; see here a PDF file with all abstracts of that conference. Trends in tropical cyclone activity over the past 20 years Read this GRL (May 2006) paper by P. Klotzbach: Emanuel's Nature paper disprooved! The Wegman Report A report on the statistics used in MBH's hockeystick paper. Condemning! Gorey truths Iain Murray finds 25 inconvient truths in Al Gore's book "An Inconvienent Truth"
List of all things caused by global warming Read this hilarious list from numberwatch... everything is referenced! There is no consensus on global warming Article by R. Lindzen in WSJ 26 June 2006: Read it! Role of tropospheric ozone increases in 20th century climate change Interesting GRL paper: models suggest up to 0.5°C O3 induced summertime warming in polluted regions. Climate Consensus and the End of Science Essay by Terence Corcoran (16 June 2006) on climate science becoming a belief system. The greening of African SAHEL Read 2 papers by Herrmann et al. (here and here) and another by Ollson et al (here) on the ongoing greening of the Sahel region: desertification is NOT on increase but decreases! Sea Ice Extent: how to get your favourite trend A caustic comment by F. Massen on a recent GRL paper by Vinnikov et al. Hurricane Katrina and the global warming science: more muddled OR settled? A very clear article from M. Khandekar, member of the AMS. The Influence of Solar Changes on Earth's Climate Authors Gray et al. Hadley Centre technical note 62 written in prepartion for the coming IPCC FAR. Large, but very clearly written report on current state of knowledge. Please read at least the extended summary. PDF format, 82 pages. Richard Lindzen will receive the LEO prize Read also these comments by Gösta Walin on the climate issue. Going Nuclear: A Green makes the case Patrick Moore, one of Greenpeace founders, pushes going to nuclear. What a change! Phenomenological solar contribution to the 1900-2000 global surface warming Read this discussion and summary of the Scafetta/West paper in GRL finding that "the sun contributed as much as 45–50% of the 1900–2000 global warming ..."
Interplay between theory and experiment An extract from a discussion by Lubos Motl, assistant professor, Cambridge, USA. Makes a very good reading! on Surface Temperature Reconstructions for the past 1,000-2,000 Years: Synthesis of Current Understanding and Challenges for the Future, Washington, 2.3.2006 " (7.5MB) Click here for a html transcript! Grace measurements of Antarctica and Greenland ice loss Twin Grace satellites measurements show Antarctica and Greenland ice loss: Nasa report, abstract, animation. Read this 2005 Antarctica report which does not agree! And finally look here and here for the problem of mass confusion and altimetry, a sceptic comment and a very good article by Pat Michaels! Hurricane Power and Global Warming read here critical comments by Pielke and Landsea on Kerry's paper, and Kerry's response. and a very short comment by Richard Lindzen Only 3 lines to read and meditate! Climate: past ranges and future changes A QSR 2005 paper by J. Esper at all: please read the conclusion! A Change in Atlantic Circulation Read here several discussions on the Bryden et al. paper (Nature, Dec.1 2005) on a measured slow-down of some part of the thermohaline flow (but NOT the Gulf Stream!). Global Warming Overkill Read this comment by Pat Michaels on a paper in Nature by Patz et al. on increasing deaths due to global warming. Read here a WHO report on this problem (published in 2000; J. Patz is a coauthor). Europe's Kyoto Bill A comment by Carlo Stagnaro from Techcentralstation: Kyoto's bill will hurt badly! Microclimate Exposures of Surface-Based Weatherstations Davie and Pielke Sr. show the problems in using ground weather stations to detect temperature trends. Hurricanes and Global Warming: do not believe the hype! Read Patrick Michaels blog on this, and look carefully at the Atlantic Multidecadal Oscillation (AMO) graph! Statement of Lord Nigel Lawson to the US Senate Committee on Environment and Public Works: highly critical about IPCC and Kyoto treaty. Schelling on Kyoto Read what 2005 economics Nobel price Thomas Schelling says about the Kyoto treaty. 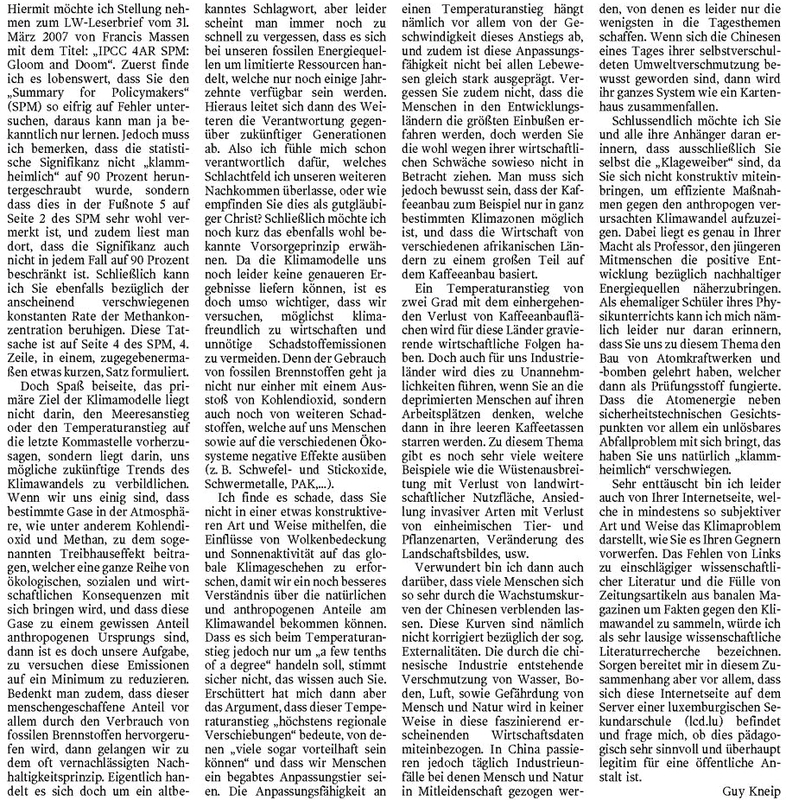 Risse im Klimakonsens German translation of the original Technology Review aricle by M. Crok, with added comments. Is global warming making hurricanes more frequent and intense? After the Katrina disaster, many jump into hasty, but convenient conclusions. Read what leading scientist say! The Other Hockeystick A very clear article by Roger Pielke Jr. from Colorado State University on disaster losses and climate. Cooling it on global warming An interview of Fred Singer (24Jul05): simple questions, clear and unpassionate answers! The Economics of Climate Change An admirable clear 84 pages report from the House of Lords, published 6th July 2005. It says what I am repeating for several years now: the best strategy to protect climate is to focus on R&D and technology, and not dilapidate money by futile Kyoto-style emission trading. Effect of scaling and regression on reconstructed temperature amplitude for the past millennium A very important paper by Esper and al. published Apr.2005 in Geophysical Rersearch Letters: different procedures in scaling/regressing proxy and instrument data give mean global temperature differences of >0.5°C! The Water Rub An easy reading comment on an important paper by Minschwaner & Dessler studying water vapour feedback (in the tropics): feedback is positive, but much less than estimated in the GCM models. Full text of original paper here. Hurricanes and Global Warming A new paper from Pielke, Landsea et al. published in June 2005 in the Bulletin of the American Meteorological Society confirms firmly that there is no link between hurricane frequency and global warming. Attention: this is the original preprint, Kerry redraw his authorship! Ghostbusting Temperatures A fresh analysis of the weatherstation data from the U.S. Historical Climatology Network database shows no overall substantial warming in the continental US. By Eduardo Ferreyra, Aug.2004. See also here and here! Climate Catastrophe Cancelled A movie from Friends of Science and University of Calgary: see and here the sceptics live! Report from Doom and Gloom A report by Dr. Benny Peiser from the Feb.2005 Exeter Conference "Avoiding Dangerous Climate Change"
Evidence Submitted to the House of Lords... ...Select Committee on Economic Affairs. By Prof. David Henderson, critical on IPCC treatment of economic subjects. Open letter to the community from Chris Landsea Chris Landsea, world specialist on hurricanes, leaves the IPCC: science shows that there is no globalwarming incidence on hurricane frequency, an IPCC lead author tells otherwise. THE TSUNAMI'S REAL CAUSE. Rising Tide Online article in the New Republican by Daniel Sarewitz & Roger A. Pielke. Annual cycles of multiyear sea ice coverage of the Arctic Ocean: 1999–2003 Read this abstract of a paper by R. Kwok: Arctic perennial ice is not decreasing as touted by ACIA... it increases! The Impacts of Climate Change (an appraisal for the future) A BIG report from the International Policy Network (UK); 1.MB, 89 pages, PDF. Makes very good reading! Plusieurs scientifiques ne croient plus à l'effet du CO2 sur le climat A non-technical article by Pierre Lutgen, published in the "Forum de l'Industrie". In French! Strange Science A non-technical article by Thomas Sieger Derr, a professor of religion and ethics. Long-term ice variability in arctic marginal seas As the media shout "the Artic melts! ", read this paper by Polyakov on actual measurements and observations! No much cause for hysteria here! "In much current research, 'alarm' is the aim rather the result"
Bad manners at the Moscow Kyoto meeting An insider report from the last Moscow July 2004 meeting, by Dr. Khandekar, Environment Canada. Kyoto won't stop climate change The very IPCC friendly NewScientist (or better its writer Fred Pearce) make some remarkably sober comments (well wrapped in the usual catastrophism). Plus some comment by meteoLCD. The Disputed Science of Global Warming A blockbuster paper by McLean (version 1.3. from 3th Oct. 2004), with many, many useful links (even if one does not agree with every word or authority cited; beware: due to automatic generation, links extending over one line do not work!). Link to full text of McIntyre/McKitrick paper showing flawed data handling and errors in MBH98. Temperaturschwankungen des letzten Milleniums wahrscheinlich grösser als angenommen What many have suspected and said before: the hockeystick temperature reconstruction is simply wrong! A Critical Examination of Climate Change Another paper by Douglas V. Hoyt on climate sensitivity; many links to more detailed explanations. 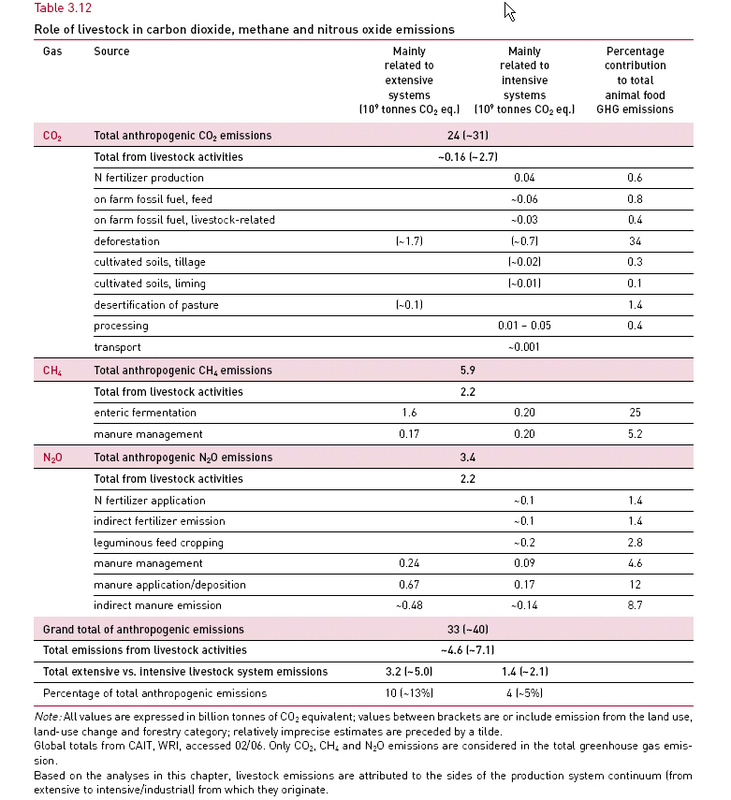 Please take a good look at the scorecard which compares IPCC model predictions and reality! Climate Change: Incorrect information on pre-industrial CO2 Thrilling statement by Prof Jaworowski for the US Senate Committee on Commerce, Science, and Transportation (March 2004). How scientifical honest are papers on ancient CO2? Worlds Apart Excellent crystal-clear article by Philip Stott! Why warming is observed and what climate sensitivity appears to be Douglas V. Hoyt explains climate sensitivity in four easy steps. Global Warming? Some common sense thoughts A nonsense detector by Reid A. Bryson. EARTH TRACK Satellite-measured lower troposphere temperatures, whole globe! Figures usually a couple of months late. Look here for NASA Goddard Space Center graphs, updated quite fast! Atmospheric water vapour feedback: positive or negative? A discussion on a new paper by Minschwaner & Dessler on upper tropospheric vapour content and its influence. Again the IPCC seems to err on the high side concerning this feedback. The full paper is here (no easy reading). Singer testimony before the US Senate A testimony of Prof. Fred Singer on unsupported global warming and global change claims. Hansen & Sato: Trends of measured climate forcing agents.pdf Paper shows that increase of most GHG's is leveling down (text highlights by meteoLCD). Hansen & Sato: Global Warming in the 21th century: An alternative scenario A very clear paper (2000) by James Hansen (Nasa Goddard Space Center), one of the first IPCC "stars"; Hansen has changed his mind quite a lot, and puts his faith now more on reducing non CO2 GHG (text highlights by meteoLCD). Kyoto-Folie 2 A small article (non scientific) published in Luxembourg's main newspaper, showing that Luxembourg has vastly exceeded it's (for 2010) planned 28% CO2 reduction... By Francis Massen (in French). Êtes-vous Kyoto-crédule? A (non-scientific) article from Francis Massen which should have been published in the major national Luxembourg paper; after many weeks of delay I decided to give it a go and put it on this website. In French! Click here for a dissenting answer (in French) from Alex Hoffmann. Kyoto = 0.07°C less warming! Hyperactive sun comes out in spots From New Scientist: Sunspots are now more frequent than at any time for more than 1000 years: is this THE major contribution to global warming ? Mann's hockey stick wrong? One of the IPCC pillars to document global warming seems to be crumbling... the data used are partially wrong or incomplete! Click here for the original MBH98 paper. Heat Wave in Europe: The Mystery Unveiled A special jetstream circulation pattern is the cause of the blocking anticyclone who caused the summer 2003 European heat wave. Cosmic-climate study cools Kyoto A short discussion on a new "blockbuster" scientific paper from Veizer/Shaviv (Geological Society of America) showing that past warming trends are mostly caused by cosmic events, and that CO2 plays only a minor role in global warming (from National Post, Canada). Christie/Spencer record of satellite data "The Christy/Spencer record begins in January 1979 and is updated monthly. According to a just-published paper (Christy et al, 2003), the global temperature trend in the lower atmosphere from earth’s surface to about 25,000 feet is 0.06ºC (±0.05ºC per decade) from January 1979 through April 2002. This trend has enormous implications because it invalidates the projections of virtually every climate model in existence!" Are Observed Changes in the CO2 Concentration of the Atmosphere Really Dangerous? C.R. de Freitas from the University of Auckland gives 14 well documented fallacies flying in the face of catastrophists. Is Antartica Sea Ice disappearing? No it is not: it is INCREASING! http://www.co2science.org/edit/v4_edit/v4n35edit.htm A very surprising trend discovered by Idso: CO2 concentration matches human population (since 1650); as this will level at near 2070, so will CO2...at about 420 ppm! http://www.co2science.org/journal/2002/v5n20c3.htm A short review of a paper from Australia researching the magnitude of the urban-island heat effect: even small towns (pop. ~1000) exhibit an approx. +2°C warming, well in excess to a "measured global warming" . http://www.co2andclimate.org/index2.html The Greening Earth Society's web site.. scientifically sound! www.skepticism.net The Gobal Warming pages of this "general purpose skeptic" site. Contains a link to an excellent aritcle of Richard Lindzen and many other interesting contributions. www.ecotrop.org site of (emeritus) Prof. Philip Stott (University of London), caustic!. Disaster, Failure or Success? "I interpret the IPCC, as far as its advisory capacity is concerned, as a mixed group of self-selected believers and officially selected experts, most of them paid directly by governments, who do not, indeed cannot, give entirely honest advice". An excellent paper by an IPCC insider! John Daly passed away the 29th Jan. 2004. We will deeply miss his clear logic and courage in pursuing scientific honesty versus ideology and Zeitgeist.